– edited by Rev. Peter Ditchfield in his regular weekly column in the Reading Mercury, 29th February 1930. Peter was the Rector of Barkham for over four decades, and involved with Arborfield for many years because of his link with the joint Arborfield, Newland and Barkham C. E. School. By this time, Peter Ditchfield was suffering illness, and died in September 1930. Mr. Chambers also produced an article on the monumental inscriptions on the walls of the old church (which were later transferred to the walls of the new church), plus a list of all the inscriptions in both the old churchyard and the new churchyard. 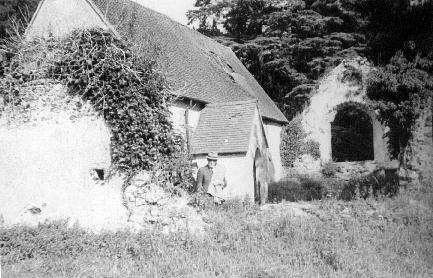 The old parish Church, which is close to Arborfield Hall, is mainly in ruins (though the north aisle was rebuilt by Sir Edward Conroy, Baronet, in 1867) and was taken down in 1869. It is much to be regretted that the graveyard, which contains the ruins of the old parish church where our forefathers worshipped God for so many centuries, is allowed to remain in such a neglected state. Will not someone help to restore God’s acre to its former beauty? This part of the freehold aisle formerly attached to the old church of Arborfield (and which was finally taken down February 1869) was rebuilt (and enlarged by proper authority) by Sir Edward Conroy, Baronet, not only to preserve the tablets and records of his family but also as a tribute of love and respect for the memories of his nearest relations who were the only members for centuries buried out of Ireland. About the centre is a light stone-covered carved coat of arms in a shallow recess; below it a marble tablet with a light grey background. Sacred to the memory of Sir Edward Conroy, of Llanbrynmair, Co. Montgomery, and of Kiltrustan, Co. Roscommon, Ireland, Baronet. He was the eldest son of Sir John Conroy, Knight and Baronet, and the lineal representative of the chiefs of the native Irish Sept of o’Maolconroy, Co. Roscommon, in the Province of Connaught. He was born in Dublin, 6 December, 1809. He married in July, 1837, at Kensington, Middlesex, the Right Honourable Lady Alicia Parsons, Daughter of Laurence, Earl of Rosse, and by her had issue an only son, John Conroy, born 16 August 1845. He died at his own house at Arborfield on the 3rd November 1869, and is interred in the family vault. This wall also contains a plain coat of arms in a shallow recess; below it are seven white marble tablets with black marble background. 3 In a vault in this churchyard rest the remains of Margaret, daughter of Francis Vernon Wilson, Esquire, of Tully, co. Longford, who died on the 4th of January, 1845, at Black Rock, near Dublin, in the 82nd year of her age. This tablet is raised to her memory by Sir John Conroy, Baronet, the only surviving issue of her marriage with John Ponsonby Conroy, Esquire, of Bellfield, county of Roscommon. 4 In the vault in the churchyard lie the remains of Elizabeth Jane Conroy, Born 13th May 1811, Died 1st May 1855, eldest daughter of Sir John Conroy, Knight and Baronet, by Dame Elizabeth, his wife. 5 Small coat of arms on this tablet. In the family vault in this churchyard rest the remains of Sir John Conroy, Knight and Baronet. He was the eldest son of John Ponsonby Conroy, of the county of Roscommon, Esq., by Margaret, his wife, daughter of Francis Vernon Wilson, of Tully, County Longford, Esq. He was born at Mazey Castle, Caernarvonshire, 21 October 1786, and died at Arborfield Hall, 3 March 1851. He was created a knight commander of Hanover by his majesty George 4th and received many other distinguished honours for his long and faithful services to their royal highnesses the Duke and Duchess of Kent and to the Princess Victoria, who on her accession to the throne created him a baronet with a promise under the hand of the prime minister to create him a peer of Ireland as soon as the state of the peerage in that Kingdom should permit a creation. This tablet is erected to his memory by his sorrowing wife and family in token of their deep love and affection. 6 This tablet is erected to the memory of Arthur Benjamin Conroy. Born 7th May, 1813. Died 24th May 1817, at Shooters Hill in Kent. He was the 2nd son of Sir John Conroy, Baronet, and of Elizabeth, his wife, daughter of Major-General Fisher, of the Royal Engineers. Also to the memory of Stephen Rowley Conroy, 3rd son of the above, late a captain in the Coldstream Guards and an aide-de-camp to the Lord Lieutenant of Ireland. He was born the 15th August, 1815, and died of pulmonary consumption at Wiesbaden in Germany on the 9th of September, 1841. Their remains are interred in a vault near this church. 7 To the memory of Thomas Mahon, who died Dec 11th 1844, in the 14th year of his age. He was the only son of Major Mahon and Henrietta, his wife, of Strokestown House, county Roscommon, and to record his premature death this tablet is placed in this aisle by his Godfather Sir John Conroy, Baronet. His remains are interred in a vault in this churchyard. 8 Sacred to the memory of Elizabeth, wife of Sir John Conroy, Knight and Baronet. She was the only child and heir of Major-General Fisher, of the Royal Engineers, and was born in the year 1791 in the government house in Quebec in Canada. She married by special licence in Dublin, 8th December, 1808, Sir John Conroy, Bart., by whom she had six children. She died 9 April, 1861. Her remains are interred in the family vault in the Churchyard of Arborfield Old Church, close by this mortuary chapel, the freehold property of the family of Conroy. This tablet to the memory of the kindest of mothers is erected by her two surviving children, Edward and Henry Conroy. 9 To the memory of Victoria Maria Louisa Conroy, 2nd and youngest daughter of Sir John Conroy, Baronet, by Elizabeth, his wife. She was born on the 12th August, 1819, and died 9th February, 1866, at Rishmere Lodge, Leighton Buzzard, Bucks. She married in 1842, Edward Wyndham Hanmer, of Stockgrove and Rushmere [sic], Bucks, Major on the Royal Horse Guards, and next brother to Sir John Hanmer, Baronet, of Bettisfield, Co. Flint, by whom she had an only son, Edward John Henry Hanmer, born at Kensington 15th April, 1843. She is buried in the vault of the Hanmer family in Simpson churchyard, Bucks. This tablet to her memory is erected by her affectionate brothers, Edward and Henry Conroy, the survivors of her family. The west window of this chapel is of three lancets with four lancelets above. The centre lancet contains the arms of the Conroy family in colours, with this motto below: “If God pleases, time cannot destroy us”. The other lancets have floral designs in yellow with borders of red.